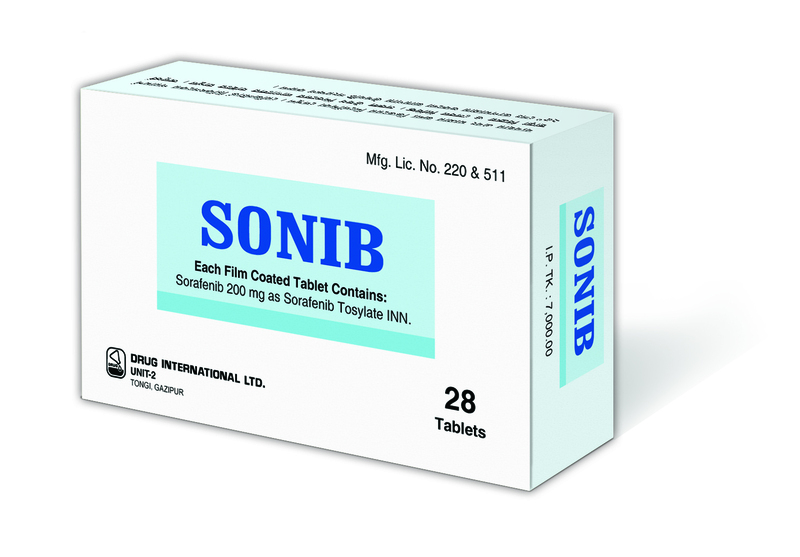 Composition : Sonib : Each film coated tablet contains Sorafenib 200mg as Sorafenib Tosylate INN. Hepatocellular Carcinoma : Sonib is indicated for the treatment of patients with unresectable hepatocellular carcinoma (HCC). Renal Cell Carcinoma : Sonib is indicated for the treatment of patients with advanced renal cell carcinoma (RCC). Use in Special Population : Renal Function Impairment: No dose adjustments are necessary for mild, moderate or severe renal function impairment in patients not undergoing dialysis. Hepatic Function Impairment : Mild (Child-Pugh class A) and moderate (Child-Pugh class B) hepatic function impairment decreased AUC by 23% and 65% respectively. Not studied in severe (Child-Pugh class C) hepatic function impairment. Dosage and administration : The recommended daily dose of Sonib is 400 mg (2 x 200 mg tablets) taken twice daily without food (at least 1 hour before or 2 hours after a meal). Treatment should continue until the patient is no longer clinically benefiting from therapy or until unacceptable toxicity occurs. It is recommended that Sorafenib should be administered without food or with a low or moderate fat meal. If the patient intends to have a high-fat meal, Sorafenib tablets should be taken at least 1 hour before or 2 hours after the meal. The tablets should be swallowed with a glass of water. Management of suspected adverse drug reactions may require temporary interruption and/or dose reduction of Sonib. When dose reduction is necessary, the Sonib dose may be reduced to 400 mg once daily. If additional dose reduction is required, Sonib may be reduced to a single 400 mg dose every other day. Or, as directed by the registered physicians. should not be used during pregnancy. It is not known whether Sorafenib is excreted in human milk.